Protect All is one product that DOES IT ALL: cleans, polishes, waxes, protects and treats all surfaces — front to back, inside and out. It is quick and easy to use and leaves an anti-static, water repellent lustrous shine on hard surfaces, while treating the vinyl, rubber and plastic. Where can I use Protect All? 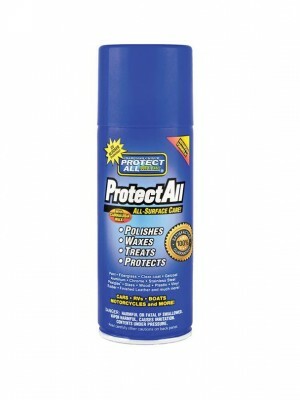 Protect All may be used on any surface, cars, boats, RVs, airplanes, motorcycles, and more. Protect All works on fiberglass, aluminum, chrome, stainless steel, paint, vinyl, rubber, Plexiglas®, plastic, Formica®, wood and glass. Yes, especially glass. Where not to use Protect All? For personal safety — to avoid slipping and falling — DO NOT GET THE SLIGHTEST OVERSPRAY ON ANY WALKING SURFACES. 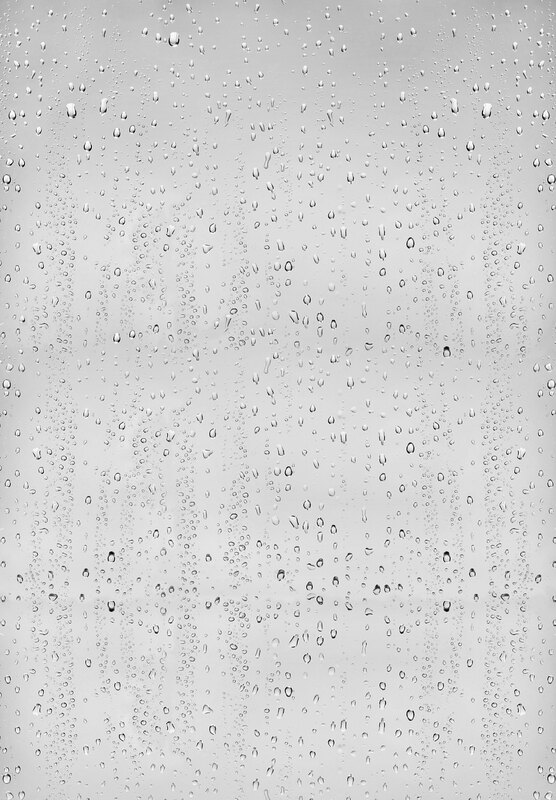 If necessary remove excess Protect All with a solvent such as mineral spirits. Will Protect All remove stains, water spots, oxidation, etc.?? Protect All is a non-abrasive, moderate cleaner. It can be used effectively on any surface without scratching. It will not remove hard oxidation, black streaks and other heavy grime the first time. For these conditions we suggest a one time application of a strong cleaner or polishing compound to prepare the surface such as Protect All’s Fiberglass Oxidation Remover and Color Restorer; then treat the surface with Protect All. It’s all you will need for future cleaning, waxing, polishing and treating. Dirt, bugs, streaks, water spots, algae and barnacles will clean off in much less time with much less effort. How do I apply Protect All?? Very quickly and easily. Start with a clean surface before first application. Shake container well. Spray a section or apply directly with a cloth very, very lightly. Immediately polish completely dry with a second cloth. The surface becomes so slick nothing will stick or adhere. [Most people think, “If a little does a good job, more does better!” Not true with Protect All.] Dirt and grime cleans off quickly and easily. Overuse is wasteful and is difficult to polish dry. If streaks appear, you have used too much. Less is best with Protect All. 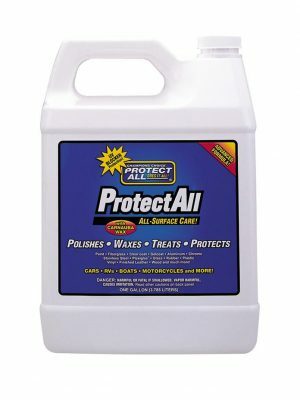 Can I use Protect All on tires, rubber trim, vinyl and plastic?? Protect All works on all rubber, vinyl and plastic surfaces, including tires. A spray and wipe treatment of Protect All gives a clean, non-oily natural appearance that’s water repellent and anti-static, attracting less dust and dirt. With regular applications, Protect All aids in preventing weather-checking and deterioration. Will Protect All smear or streak on glass and mirrors?? NO! If streaking occurs you have used too much, or did not wipe completely dry. Mirrors and glass sparkle. Water rolls off as you travel. Bugs and dust wipe off quickly and easily, too. Should I remove old wax?? Only if you have a build-up that is turning yellow or chalky. There is no need to remove wax from a surface in presentable condition. If you have a great shine already, an application of Protect All will enhance the surface making future cleaning and polishing easier and quicker. How long does Protect All last? How often should I use it?? An application will last up to six months depending on climatic conditions and exposure to the sun. However, you may use Protect All as often as you like with no excessive build-up. Use it regularly to keep maintenance to a minimum. It’s easy, quick and you are polishing and waxing every time you clean. Protect All works best at temperatures between 60 and 90 degrees Fahrenheit. Keep Protect All from freezing. There are many good products on the market made to work on specific surfaces. Protect All is one product formulated to work on all surfaces replacing five to ten different products. When used properly, one 16 ounce bottle of Protect All will polish, wax and treat all of a cars’ surfaces seven to eight times. Protect All is extremely cost effective. How much detailing is necessary?? Most waxes dry to a haze and require buffing and detailing cracks with a brush. Protect All dries clear requiring less detailing and fewer man hours. What is a UV Blocker?? The ultra-violet rays of the sun cause damage and deterioration to most surfaces. Used regularly, the UV Blocker in Protect All aids in preventing deterioration. How does Protect All reduce waste?? Protect All works on so many surfaces that it eliminates the need to buy five to ten different products for your vehicles. This translates into fewer containers thrown into landfills. Many contain unused products that have dried up and are now considered hazardous waste, illegal to throw away. With Protect All you have only one container of which to dispose and some containers may be refilled and used many times over. Protect All does it all to the last drop … there’s nothing left to waste.